"They call me the half-breed. The first time they killed me, I was ten. They’ve been hunting me all my life. It’s time I stopped running." Born of a Bastian mother and a Crovir father, a half-breed who is abhorred by the two Immortal races, Lucas Soul spends the first three hundred and fifty years of his existence being chased and killed by the Hunters. 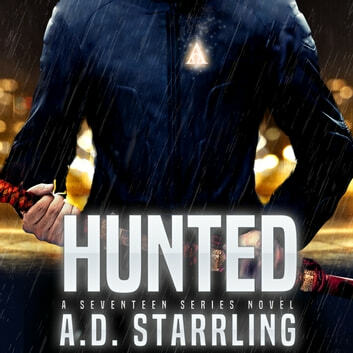 One fall night in Boston, the Hunt starts again, resulting in Soul's fifteenth death and triggering a chain of events that sends him on the run with Reid Hasley, a former US Marine and his human business partner. From Paris to Prague, their search for answers leads them deep into the Immortal societies and brings them face to face with someone from Soul’s past. Shocking secrets are revealed and fresh allies come to the fore as they uncover a new and terrifying threat to both immortals and humans. To defeat his enemies, Soul must embrace his tortured fate and become the Hunter. But time is running out. Can he protect the ones he loves and prevent another Immortal War before his seventeenth and final death? Hunted is the first installment in AD Starrling’s bestselling supernatural thriller series Seventeen. If you like high-octane, fast-paced adventures that combine science and fantasy then you’ll love the world of Seventeen.